A banner from Return of the King. When Amazon spent $250 million to acquire the rights to make a Lord of the Rings show, we assumed it would be a completely new version of the J.R.R. 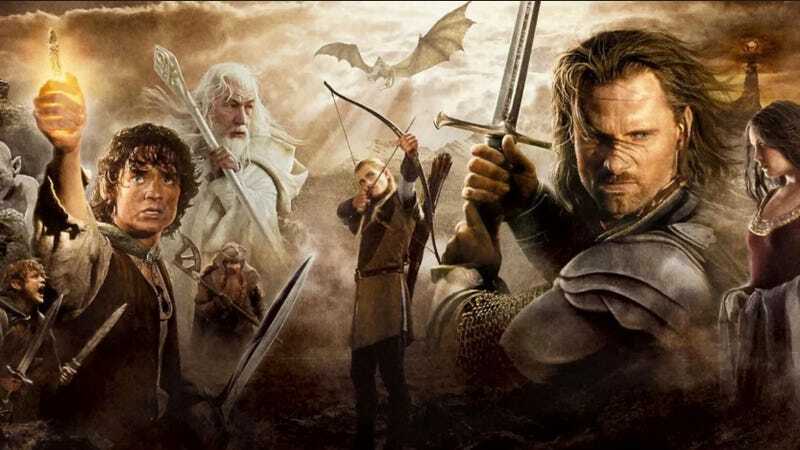 Tolkien story as compared to the popular Peter Jackson film series. And yet, a new report has us wondering whether or not the two will be connected. Let’s unpack that. The report, sadly, does not expand on the idea; and admittedly,“material” could mean anything. It could mean something simple, like costumes, props, or sets. (Some sets still exist in New Zealand, as any tourist of that country will tell you.) It could also mean footage from the movies or actors reprising their roles. Yes, Elijah Wood is technically “material from the films” if you want to get literal about it, and Sir Ian McKellen has said he’d come back as Gandalf. An ability to use materials, however, doesn’t mean it’s a certainty. A contractual provision like this could have just been added in case there was some small overlap to avoid any potential lawsuits. Considering the deal requires Amazon to make at least five seasons of the show which could result in a cost north of $1 billion, it makes sense to cover every conceivable base. Part of that, too, is reported conversations with The Lord of the Rings director Jackson. Though he and his team weren’t part of the initial deal, THR says a dialogue between the parties has begun. Again, there’s no word as to what that means specifically. With potentially bringing in Jackson and using materials from his movies, the main question would be... “Why?” Amazon’s take on The Lord of the Rings should be immediately different and distinguishable from Jackson’s films or it isn’t worth the investment. If the company just wanted to remake the films, it could have just bought the rights to the films themselves. They’re pretty good. No, this is a property Amazon obviously believes can be a varied source of revenue for decades. As for when audiences will finally get some answers, the deal specifies that production on the show must start within two years. So, early in the next decade, it will be time to go back to Middle-earth and destroy that ring once again. You can read much more on the show and its deal at the link below.